Precious Ramotswe has only just set up shop as Botswana's No.1 (and only) lady detective when she is hired to track down a missing husband, uncover a con man, and follow a wayward daughter. However, the case that tugs at her heart, and lands her in danger, is a missing eleven-year-old boy, who may have been snatched by witchdoctors. First published in the UK in 1998, and in the USA in 2001 by Polygon. Republished in 2002 and 2003 by Anchor. Smart and sassy...Precious' progress is charted in passages that have the power to amuse or shock or touch the heart, sometimes all at once. The Miss Marple of Botswana. Why is this novel so good?…It is almost impossible to pin down such an inspired invention. Practical, non-judgemental, filled with laughter but determination, Precious never quails....I loved every word. One of the most entrancing literary treats of many a year…. A tapestry of extraordinary nuance and richness. The author's prose has the merits of simplicity, euphony and precision. His descriptions leave one as if standing in the Botswana landscape. This is art that conceals art. I haven't read anything with such alloyed pleasure for a long time. Images of this large woman driving her tiny white van or sharing a cup of bush tea with a friend or client while working a case linger pleasantly. General audiences will welcome this little gem of a book just as much if not more than mystery readers. ...pure joy. It's about the mysteries of human nature. The writing is accessible and the prose is so beautiful; you can read this in one sitting. 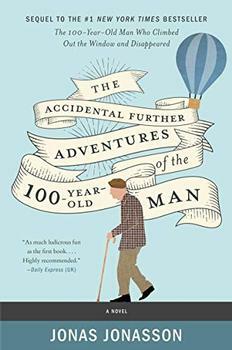 The hysterical, clever, and unforgettable sequel to Jonas Jonasson's international bestseller The Hundred-Year-Old Man Who Climbed Out of the Window and Disappeared.